"...the dimensions of the helix are so noncritical that a helical beam antenna is one of the simplest types of antennas it is possible to make." This statement by the inventor, Dr. John Kraus, points out just one of the reasons we decided to experiment with helices. The circular polarization was another reason since it might lead to less multipath distortion. But what we found was that the antenna was neat looking yet unfamiliar to most viewers. Several helices were built from Kraus' specifications using an 0.06"± aluminum plate, about 12" in diameter, as the groundplane and main structural member. 0.75" to 1.25"PVC pipe and fittings were then glued tightly, through a drilled hole, to the plate and an N connector mounted, all so that the helix centered itself on the ground plane. 7 to 15 turns of 0.25" aluminum tubing were wound first to the correct diameter and then stretched open to the correct spacing. The end of the tubing nearest the groundplane was flattened and drilled to fit over a 4-40 brass machine screw which was filed to fit the N connector's, center solder lug. To this lug was applied Ilsco De Ox compound, on the suggestion of K6HSJ, to prevent oxidation. The tubing was hung from a PVC pipe attached to the groundplane and kept in place by wire ties. My dimensions for the ground plane are a bit shy of an optimum of around 13" diameter, but the antenna seems to perform well and I used the aluminum I happened to have on hand.Other methods are being tried to more securely and accurately attach the tubing to the PVC structural element. Initial measurements indicate very broad bandwidth as suggested by Kraus. See Glenn Elmore's Garage pagesor his OCAR pages for more detail on use and measurements. 1/16" Cu plate soldered to one end with 2@ BNC connectors and in center, brass tube, also soldered, 1/2OD with 15/32" ID tube slipping inside for tuning. Loose end cap at other end. 1.5" Cu pipe, SMB connectors mounted on side of pipe or end, 3.8" down from end, brass tubes slightly smaller than 900 filter, again slipping inside each other for tuning, 1.5" end cap. Mount 2 each of above end to end and tune both ends for a flatter top of bandpass. 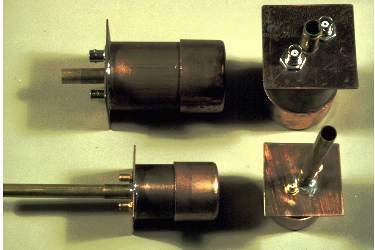 Copper, inter-digital filters have also been tested.